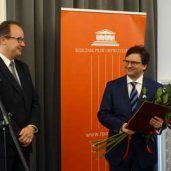 Co-founder of the anti-fascist ‘NEVER AGAIN’ Association Rafal Pankowski was awarded the prestigious annual Human Rights Distinction by Poland’s Ombudsman Dr Adam Bodnar in a ceremony held in Warsaw’s Old Town on 25 September. The celebratory speech was delivered by Marian Turski, a Lodz Ghetto and Auschwitz survivor who is Chairman of the Council for the Museum of the History of Polish Jews and Deputy Chairman of the Association of the Jewish Historical Institute as well as a member of the International Auschwitz Council. Coincidentally, the Australian-based Jerzy Boniecki Foundation has also decided to give its prize to Rafal Pankowski in a separate ceremony held at the Warsaw Uprising Museum on 30 September. The prize was awarded ‘for educational, public and cultural activity in favour of racial, ethnic and religious tolerance and for the efforts in the construction of civil society and democracy.’ The candidate was nominated by Professor Jan Pakulski of the University of Tasmania. The awards came during ‘NEVER AGAIN’s busy period of activity on both national and international level. On 17-22 September, ‘NEVER AGAIN’ member Natalia Sineaeva-Pankowska participated in the programme on ‘The European Holocaust Research Infrastructure’ held in Lviv (Ukraine) by the NIOD Institute for War, Holocaust and Genocide Studies (Amsterdam) in cooperation with the Center for Holocaust Studies at the Institute for Contemporary History (Munich) and the Center for Urban History of East-Central Europe (Lviv). On 27 September, the ‘NEVER AGAIN’ Association, together with the History Meeting House (Warsaw) and the Heinrich Boell Foundation (Phnom Penh), co-organized a film screening and discussion on ‘The Khmer Rouge Genocide and Cambodian society’ with the participation of expert speakers from Cambodia, Germany and the USA. On 26-27 September, Dr Anna Tatar represented ‘NEVER AGAIN’ during the conference on ‘Models of Civil Society’ held at the European Parliament in Brussels. On 27 September, ‘NEVER AGAIN’ activist Stanislaw Czerczak led the discussion on sports, tolerance and identity during the film festival ‘Regional Identity’ organized by the Zbigniew Herbert Library and the ‘Europe Direct’ Centre of European Information in Gorzow Wielkopolski. On 28 September, Dr Maciej Kaluza participated on behalf of ‘NEVER AGAIN’ in a discussion about the current rise of Islamophobia with imam Youssef Chadid, organized by the Jewish Community Centre in Krakow. In this context, Monika Bobako’s book ‘Islamophobia as technology of power’ was published with the support of the ‘NEVER AGAIN’ Association on 21 September. On 29 September, Rafal Pankowski presented experiences of the ‘NEVER AGAIN’ Association during the conference on ‘Promoting diversity and a discrimination free environment in host cities during and after the FIFA World Cup 2018’ organized in Moscow by the Office of the United Nations High Commissioner for Human Rights and the Moscow City Council. He discussed the achievements and legacy of the ‘RESPECT Diversity’ programme implemented by ‘NEVER AGAIN’ around the Euro 2012 Football Championships in Poland and Ukraine. On 1 October, Rafal Pankowski will speak at a debate entitled ‘How to stop xenophobia?’ organized by Poland’s main daily newspaper ‘Gazeta Wyborcza’ at the University of Warsaw as part of the Festival of Science. On the same day, through its ‘Music Against Racism’ campaign, ‘NEVER AGAIN’ supports the anti-racist music concert ‘Grand Festival Robrege’ held in front of the Palace of Culture and Sciences in the Warsaw city centre, headlined by the French artist Manu Digital and the Polish reggae legend, Izrael. ‘NEVER AGAIN’ is an independent monitoring and educational organization established in Warsaw in 1996. 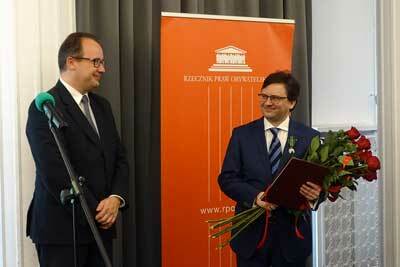 It deals with the commemoration of the Holocaust as well as contemporary issues of diversity and tolerance.